All intern projects involve: identifying a challenge in student learning, developing and implementing a teaching plan using backwards design, and then analyzing student learning data. For each step, see below for detail. 1- Complete the prerequisite, which is one semester-long teaching and learning course. Delta’s Effective Teaching with Technology, The College Classroom, Diversity in the College Classroom, Instructional Materials Development, and Informal Education courses all fulfill this requirement. Online courses through CIRTL also may satisfy this requirement. The coursework can be in-progress when you apply for the internship program. 2- Identify your project and faculty or staff partner. Many students enter into the internship program with a project in mind. Others select from the internship opportunities the Delta Program has developed and identified. The first “Pre-Internship Workshop:Finding a Project,” for interns who do not yet have a specific project or partner in mind, is held in October for spring projects and March for fall projects. Your faculty or instructional staff partner will provide feedback and guidance during the project. Interns are responsible for selecting their project and partner, though the Delta Program can help by identifying potential partners and forging connections. 3- Proposal development includes completing literature review, and shaping and aligning your learning goals, assessments, activities and study methods. Project development workshops in the pre-internship series are: Developing your project, Writing measurable learning outcomes, Using the education literature and web-based resources, and Incorporating learning communities and learning through diversity into your projects. 4- Complete the Human Research Protection Program (IRB) training because you will be implementing a teaching-as-research project. Prior to the start of your project, all interns are required to complete a brief (1-2 hours) online certification in human subjects research, and submit an abbreviated Delta IRB form. The Delta Program will help you navigate these processes by providing more information during the Pre-Internship Workshop and subsequent communications. Advisor Approval Form: You must submit the Advisor Approval Form, signed by your research advisor. This is so all parties are aware of and support your participation in the internship program. Curriculum Vitae: We ask for a copy of your CV so we can review your experiences and interests. 6- Attend Delta Internship Seminar, which meets weekly for one and a half hours through the semester. It is usually taken during the term you implement your internship project, or in the spring semester for summer projects. The cohort offers support and also serves as a sounding-board for ideas, feedback, and review. Students must register for the Internship Seminar, which carries an optional 1 graduate-level credit. Students can opt-out of the credit, something most postdocs do. 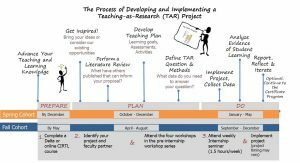 7- Implement your teaching-as-research internship project with the guidance of your partner and with support from your internship cohort, research advisor, and the Delta staff. We estimate that students typically spend 3–5 hours per week on their projects during the term, including meetings with partners and the seminar sessions. This timing is highly variable depending on your project goals. Submitting a Reflective Statement: This one-page statement should detail how your internship experience influenced your understanding of the three Delta pillars (teaching-as-research, learning communities, and learning-through-diversity). Submitting a Final Summative Report or Poster: This report is essentially a record of your teaching and learning activities that others can build upon, similar to a research paper in your discipline. Feedback, questions or accessibility issues: info@delta.wisc.edu.